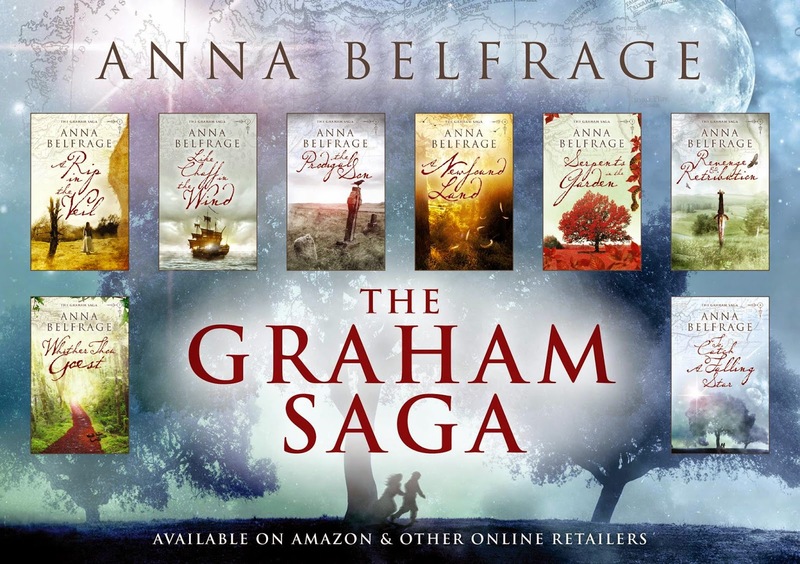 Just One More Chapter : Guest Post with Anna Belfrage "And Then What?" Well, now they're all out there - the original eight books in The Graham Saga. And, dear readers, this writer is suffering from withdrawal symptoms, which probably means we will have to visit a couple of times more with the Graham family - I do have this niggling sense of unease that Richard Campbell is not quite finished with them, horrible man that he is. Plus, of course, Mercedes has been standing in the wings for a long, long time, demanding her moment in the limelight. Problem is, I am somewhat ambivalent to Mercedes. "Yeah, you and me both," Alex mutters. But still, there’s potential in the story of a girl born just as thunder strikes the Cathedral’s bell tower in 15th century Seville. Especially if the girl is Jewish. Even more so when she has magical talents that in themselves are sufficient to condemn her to being roasted alive. So maybe it’s no wonder Mercedes turns out as she does. Anyway, I am glad to report that there is much more in my head than Matthew and Alex Graham. “What?” Alex gives me a disapproving look. “Who cares about Adam and what’s-her-name?” Alex demands. Adam de Guirande is a man who has more than one reason to love his lord, the enigmatic and ambitious Roger Mortimer. In 1321, Adam marries Kit Coucy – except he thinks he’s marrying Katherine de Monmouth, and doesn’t take it all that well when he realises he’s been played the fool. Not that Kit had any choice, but Adam has a hard time believing that. When the conflict between Baron Mortimer and Edward II explodes into armed conflict, Adam has no choice but to ride with his lord, no matter that treason comes with dishonourable death. With Mortimer in chains, and Adam’s at death’s door, only one person cares enough to come looking – Kit. And that, people, is but a brief introduction to a story that will require at least three novels to tell in full. A story where passion and drama play out against a complex political situation, where today’s traitor may be tomorrow’s hero, and the Wheel of Life never stops rolling. “It’s difficult to hold on to your honour in a world where allegiances change overnight,” Matthew mutters, and I know he’s thinking about his own experiences during the English Civil War. Come to think of it, in many ways Adam and Matthew live through similar experiences. Other than Adam and Kit, there’s also a WIP involving three reincarnated souls, tied to each other due to events in the distant past. Jason Morris has spent three millennia trying to find Helle again, the woman he loved and lost in a time when the fall of Troy was still a memory, not yet a legend. Helle Madsen has no idea who he is, this man with hair a glorious shade of mahogany, but he’s hot as hell and seems a far nicer person than Sam Woolf, a.k.a. Samion, the Wizard Prince of Kolchis. Too right, Helle! Sam Woolf may be utterly delicious on the outside, but he is rotten to the core – as Helle soon finds out for herself. At this point in time, I have no idea what genre this story falls under, but I do have a tentative name for the series, The Wanderer. Suffice it to say there’s plenty of action and steam. Very much steam, actually. Plus a cat called Kublai Kahn. So, it’s not as if I will run out of books any time soon, is it? In actual fact, time, rather than imagination, is the limiting variable when it comes to my writing. Seriously, I need another twelve hours or so per day. “Huh.” Alex gives me a long look. “At this rate, you’ll soon forget about us.” She moves closer to Matthew and takes his hand. There is a glimmer of something suspiciously like tears in her eyes, and she looks a bit forlorn, abandoned even. Matthew leans towards her and kisses her tenderly on the cheek, a small smile playing over his long mouth. Forget them? Is she crazy? Dearest Alex and Matthew, you don't need to worry about competition: I will carry you always - always - in my heart! I dab at my eyes, and here’s Matthew crushing me to his chest, while Alex pats my back and hands me a handkerchief. Sheesh, I can’t stop crying, silly idiot that I am. “We love you anyway,” Matthew assures me, and I scrub my face across the rough linen of his shirt and think I love him much, much more than he loves me. After all, he has Alex – which is how it should be, given that I made them like that: two hearts that beat in perfect synchronisation, two people meant for each other since long before they were born. I will return to Matthew and Alex – of course I will. But in the meantime, here come Adam and Kit! Thank you for the post. I've wanted to read this series and wanted to wait till I could read them back to back. :) So now they are all out there. Time to catch up.